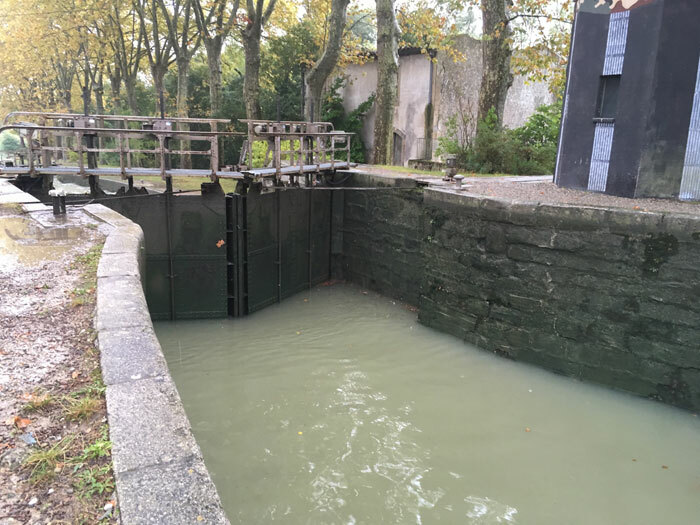 Photos by Michael Herschensohn: Michael Herschensohn writes about the similarities between locks on the Canal du Midi and those for the Lake Washington Ship Canal. A humpback bridge on the Canal du Midi. It will come as a surprise that Queen Anne pioneer Thomas Mercer had something in common with the Roman emperor Nero. It turns out, though, that he actually does. Mercer, who on July 4, 1854 gave Lake Washington and Lake Union their names, dreamed of a connection from Lake Washington through Lake Union to the sea. Nero, who lived in the first century C.E. dreamed of a connection from the Mediterranean Sea to the Atlantic Ocean across the south of France. Mercer’s idea waited over 50 years for its opening day; Nero’s almost two centuries. Both projects seemed like outlandish ideas when they were proposed: both required revolutionary engineering, were great commercial successes, were gigantic projects that the local government couldn’t undertake, eventually lost their commercial value, and both now serve successful and lucrative tourist purposes. Naturally, I am drawn to the Canal du Midi both for the great tourism opportunity and the rare chance to put our neighborhood canal into a broader historic context. The Canal du Midi opened to commercial shipping in 1681. Louis XIV, the Sun King, who ruled France from 1643 — when he was 5 years old — to 1715, embraced this canal as one of his first improvements to the infrastructure of France. Stretching some 240 kilometers, it joins the west coast of France with its southern edge along the Mediterranean. It eliminated the need to go around Spain and through the Straits of Gibraltar. It joined the two coasts of France through French territory cutting more than 10 days off the trip. 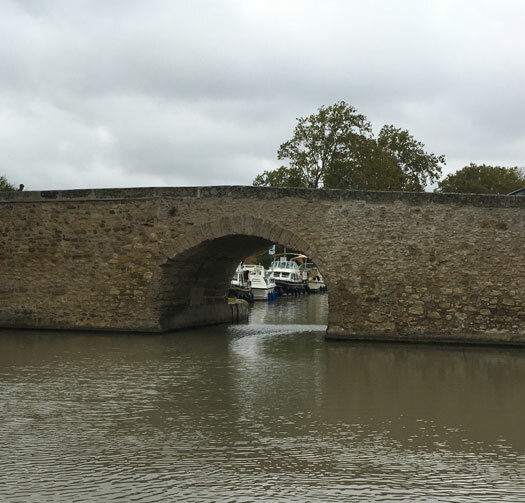 Pierre-Paul Riquet, the architect/builder of the Canal du Midi, had no training in architecture, hydrology or road building. He was simply driven by crazy passion, maybe a bit like Hiram Chittenden, the designer of the Lake Washington Ship Canal. Convincing Louis XIV to fund his canal was easy, even though the king’s support wasn’t enough to finish the job. Riquet, a tax collector for the state, had to invent endless schemes to pay for the canal and to support the 12,000 workers who dug it. Riquet’s great invention, not unlike Hiram Chittenden’s replumbing of the White River and the reversal of the flow of water through Lake Washington, involved channeling mountain streams to fill the canal. No one had ever imagined such a solution before Riquet. Unlike the rather short Lake Washington Ship Canal, the Canal du Midi had to go over a relatively low ridge to the divide where water flowed west to the Atlantic and east to the Mediterranean, and unlike our canal which has only one lock, the French one has over 91 of them, many with multiple basins. Riquet was lucky when it came to designing the locks themselves. About a hundred years before his huge project, Leonardo da Vinci had invented the miter lock, which uses the pressure of the water flowing downstream to close and seal the two side panels tight at a 45-degree angle. Lockkeepers empty the locks here on the Canal du Midi by opening small doors on the bottom of the downstream gates. Going down each 9-foot-high lock takes about 5 minutes. Tying up and untying adds a minute or two, top and bottom. The early 20th century Ballard locks (now named for Hiram Chittenden) worked exactly the same way as Riquet’s 17th century locks, although at 20 feet they are higher. I should note that the salt water west of the Ballard Locks and the dimensions of the big lock there make the 20th century locks just a bit more complicated than what da Vinci invented, but not much. On your next visit to the Ballard Locks, make sure you look at the 45-degree angle of the closed locks and think of da Vinci. Much as the two canals are alike, they differ in a few other ways. Chittenden built the Lake Washington Ship Canal with three drawbridges that allowed tall-masted boats unobstructed passage. The Canal du Midi has none. Riquet designed 126 elegant humpbacked bridges that infrequently connected the two shores of the canal. Seagoing vessels entering the canal demasted to avoid the low bridges and turned propulsion over to three horses who pulled the vessels from the towpath. Chittenden did not anticipate a need for a towpath; the boats in his day were all self-propelled. In the mid-19th century, the advent of the railroads eliminated commercial traffic on the Canal du Midi. Oddly, when it opened, the Lake Washington Ship Canal eased the demise of the little railroads around Lake Washington, while the eventual depletion of the forests and the advent of much cleaner coal than what could be pulled from Roslyn and Newport mines ended commerical traffic on Seattle’s canal. Now, both canals are incredibly active with tourism. Privately owned boats seem to navigate the Lake Washington Ship Canal, while the Canal du Midi attracts huge numbers of rented boats that slog east and west at a leisurely 6 mph. Approaching the end of our trip at Béziers, we spend an hour passing through the giant Fonseranes locks with seven basins, one of the engineering marvels of the 17th century. The incredible seven-step staircase requires two lockkeepers and lots of patience. While the entire canal is a World Heritage Site, only these locks are recognized by the French government as historic monuments. After some 160 kilometers and countless locks, I am still thrilled by the enormity of Pierre-Paul Riquet’s astonishing achievement. I waffle a bit when it comes to Hiram Chittenden’s. His Lake Washington Shipping Canal is but a modest achievement when compared to the Canal du Midi, but his genius may lie in knowing how to keep his project short and to the point.